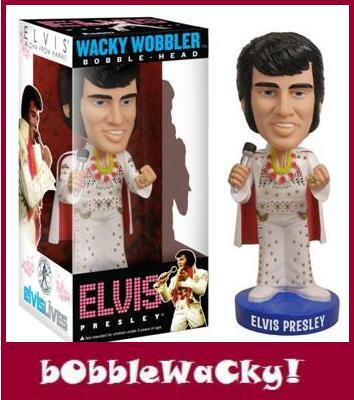 From his Jan. 14, 1973 concert from Hawaii comes Funko's Wacky Wobbler Bobble-Head tribute to Elvis Presley in his white rhinstone-encrusted jumpsuit and cape and holding a microphone. Elvis Hawaii concert was the first such performance to be broadcast via satellite around the world. More than one billion viewers tuned in from more than 40 countries to see the King of Rock 'n Roll. Elvis wore his iconic white "American Eagle" jumpsuit and performed one of his most memorable concerts. He belted out many of his current hits while passing out scarves to the adoring crowd. The show is probably the most remembered for his blistering performance of his classic "An American Trilogy." Vinyl figure stands about 7" tall. Collect all the other hits from our ever-expanding line of Funko products!